Lausanne, Swittzerland, November 9, 2015 – It was another exciting week of volleyball at club level. Find out all the latest results and news from national leagues around the world. Defending champions Diatec Trentino suffered a shock 3-1 (25-22, 20-25, 27-25, 25-13) loss to Sir Safety Conad in the Serie A on Sunday. Perugia's Serbian opposite Aleksandar Atanasijevic Serbia scored 33 points and was named MVP of the game in front of 3,500 fans. Mitar Djuric of Greece was top scorer for Trentino with 21 points. 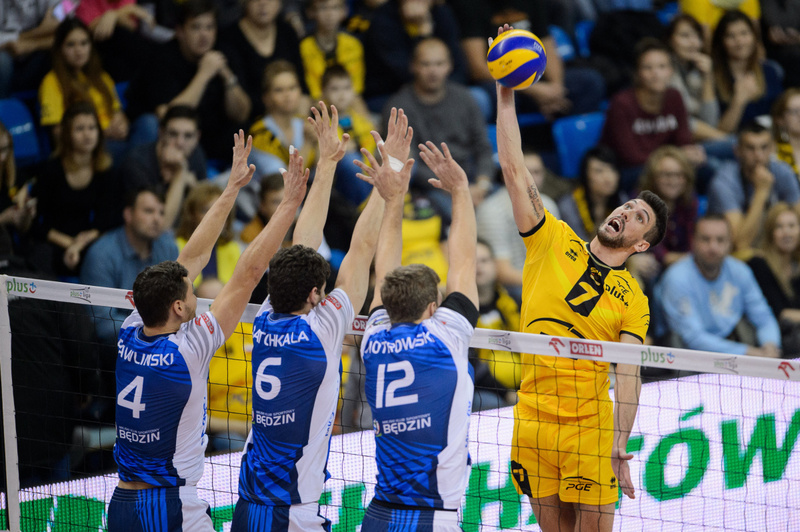 DHL Modena remained undefeated after three rounds, sweeping Revire Milan 3-0 (25-15, 25-21, 25-12) at home with Luca Vettori leading the scoring with 18 points. 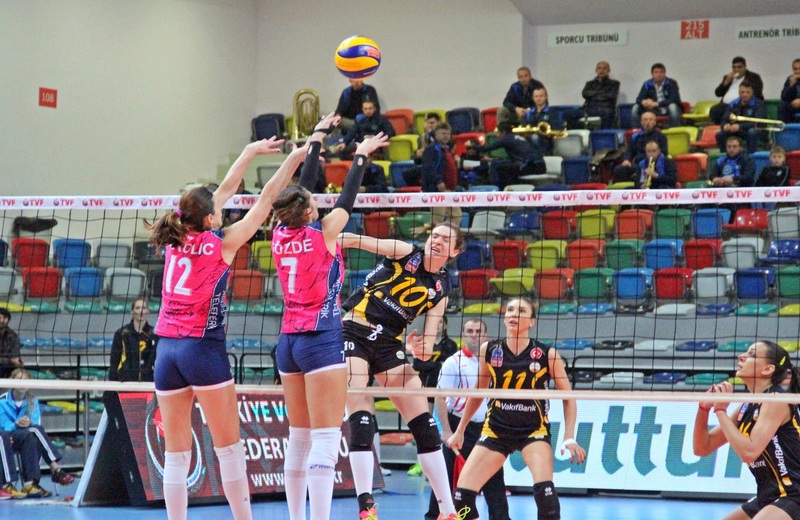 The result sees Modena leapfrog Trentino at the top of the table, after Cucine Lube Banca Marche Civitanova (the only other undefeated team after three matches) dropped a point in their home win over Ninfa Latina 3-2 (25-20, 23-25, 23-25, 25-23, 15-11). Osamany Juantorena was the leading force behind Lube's win, scoring 28 points, to counter the 17 scored for Latina by Simon Hirsch of Germany. Igor Gorgonzola Novarra remained the only undefeated team in the Italian women's Serie A, after downing Liu Jo Modena 3-1 (25-18, 22-25, 25-15, 25-23) with Samanta Fabris scoring 19 points and Aurea Cruz of Puerto Rico and Caterina Bosetti adding another 15 each. 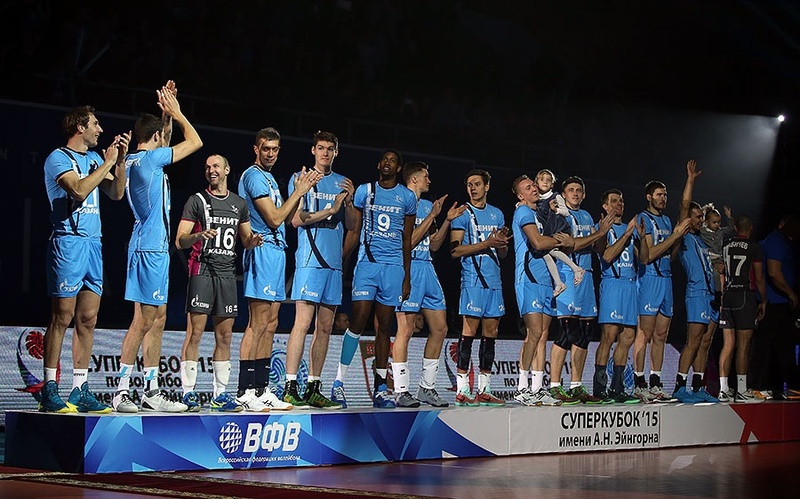 Just over a week after losing the FIVB Volleyball Men’s Club World Championship title to Brazil's Sada Cruzeiro, Zenit Kazan bounced back to kill two birds with one stone. With Cuba's Wilfredo Leon scoring 19 points, Zenit defeated Belogorie Belgorod 3-0 (25-21, 29-27, 25-15) at home to win the Russian men's Supercup. The very same match was also the opening game for the 2015-16 Russian Superleague, which sets Vladimir Alekno's team off on the right foot to defend their title. Zenit Kazan on the podium after defeating Belogorie Belgorod to win the Russian men's Supercup. Dinamo Moscow scored a huge away win in the Dinamo derby defeating their Krasnodar counterparts 3-2 (23-25, 25-18, 25-17, 21-25, 15-10) to remain undefeated after five rounds in the Russian women's Superleague. Tatiana Kosheleva started for the first time this season, but her 27 points were not enough for Dinamo Krasnodar to hold off their opponents. Natalia Obmochaeva scored 30 points for Dinamo Moscow, with Anastasia Markova adding another 18. Earlier in the week Dinamo Moscow had defeated Zarechye-Odintsovo 3-0 (25-16, 25-13, 25-23), while Dinamo Krasnodar lost at home to defending champions Dinamo Kazan in straight sets 25-19, 25-18, 25-17). Dinamo Kazan continued their winning streak with a 3-0 (25-21, 25-21, 25-19) shutout of Omichka Omsk at home over the weekend. However, on account of the point dropped by Dinamo Moscow at Krasnodar, Proton of Balakovo climbed to the pole position in the standings after coming from a set down to defeat Yenisei 3-1 (22-25, 25-23, 25-21, 25-23) in Krasnoyarsk, led by Anna Makarova's 20 points. The 11-team women's Superleague takes a break until 12 December. Meanwhile, the Russian Cup gets underway with pools in Saint Petersburg, Saratov, Ekaterinburg and Anapa. Asseco Resovia Rzeszow and PGE Skra Belchatow are the only teams on full points after two rounds of play in the Polish men's PlusLiga. Powered by Bartosz Kurek's 15 points, defending champions Resovia defeated BBTS Bielsko-Biala 3-0 (25-21, 25-17, 25-18) at home, as Skra were downing MKS Bedzin 3-0 (25-18, 25-23, 25-15) with Mariusz Wlazly named MVP of that match. Chemik Police lead the standings in the women's Orlen League with a perfect record after six matches, including their latest 3-0 (25-20, 25-16, 25-22) win over SK bank Legionovia Legionowo, where Izabela Kowalinska scored 15 points. Sada Cruzeiro of Contagem defeated Funvic of Tabaute 3-0 (33-31, 25-14, 25-21) to win the Brazilian men's Supercup, just a few days after reclaiming the FIVB Volleyball Men’s Club World Championship trophy. The defending champions begin their quest to retain their domestic Superleague title midweek against Isabela Bento Goncalves. Defending women's Superleague champions Rexona-Ades Rio de Janeiro started off the season with a 3-0 (25-16, 25-16, 25-22) win over Pinheiro of Sao Paulo to claim the Supercup in Brazil. The women's league in Brazil begins next weekend. The Istanbul teams of Vakifbank and Galatasaray continue to lead the Turkish top women's league, still undefeated after five rounds. Led in scoring by Lonneke Sloetjes of the Netherlands, Vakifbank scored a 3-0 (26-24, 25-15, 25-13) away win over Bursa Buyuksehir, while Galatasaray defeated Ilbank Ankara 3-1 (25-21, 25-21, 26-28, 25-19) at home with Nadia Centoni of Italy bringing in 21 points. 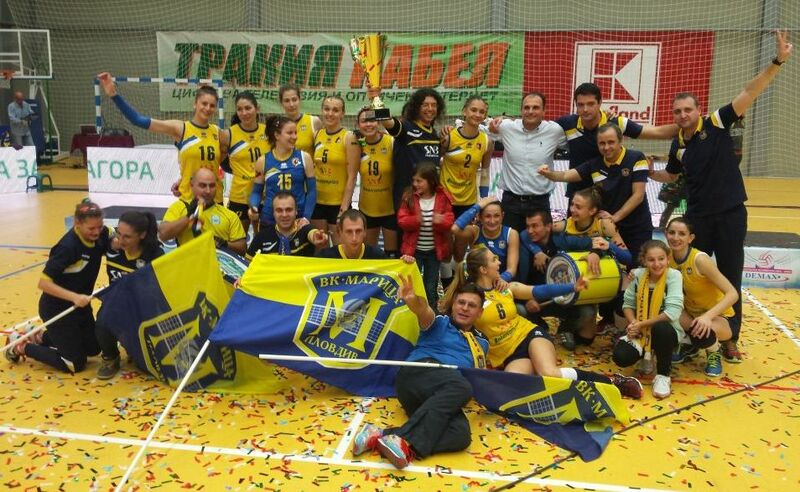 Maritza Plovdiv won the inaugural Super Cup of Bulgaria to shape up a historic golden treble on the domestic women’s volleyball scene. The team representing Bulgaria in the 2016 CEV Volleyball Cup claimed a 3-1 (19-25, 25-16, 26-24, 25-19) victory over its archrival Levski Sofia in Stara Zagora, with Tania Sabkova (19 points) and Viktoria Grigorova (18) leading the way. Kremena Kamenova of Levski was top scorer of the game with 20 points.